Greetings friends! I’m writing from smokin’ hot Alberta where the temperatures have been roasty toasty the last week. Usually this far north we cool down at night, so most of us get by without air conditioning, but not so much lately nights are staying really warm too. 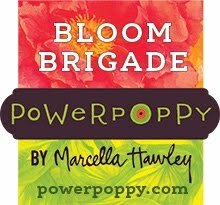 We’ve got fans running 24-7 right now. It’s supposed to cool down for a couple of days and then heat right back up again. 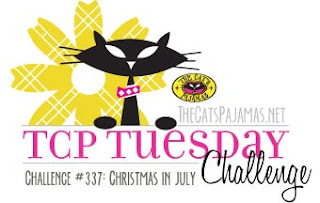 Which made it so ironic to play along in our TCP Tuesday challenge this month! The theme is Christmas in July! 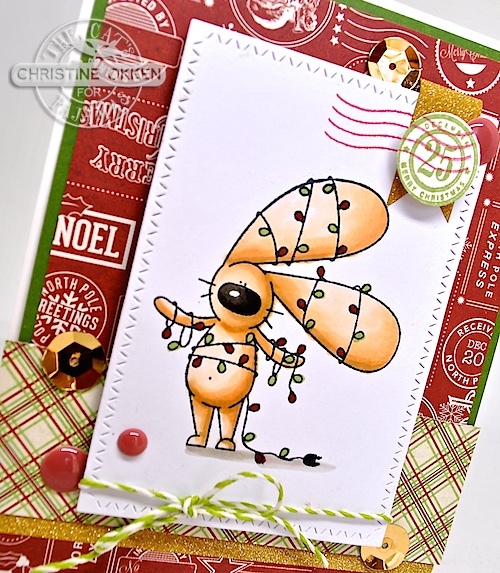 It runs all month, so in case you feel like cooling down in the stamp zone, and getting ahead on your Christmas designs, you could win a fabulous $50 in Cat’s Cash for the store. With a NEW release just around the corner, it’s a great time to play. I pulled out the adorable set, All Is Bright to play with. And who hasn’t felt like this trying to untangle Christmas lights right? I coloured our bunny with Copics and paired him with a lot of patterned paper to be really festive. 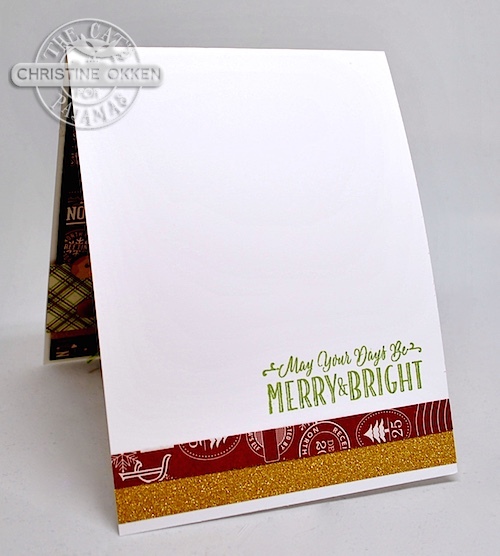 For accents I’ve used some gold washi tape, enamel dots, gold sequins, and the postage stamp from another TCP set, J*lly H*liday, that’s back for a short time by popular demand. I thought the postage marks paired really well with the paper. A bit of twine to anchor the bottom of the design, and below is a peek at the inside, which has a sentiment from another TCP Christmas set, Santa is Coming. So please, pop on over and enter in our Christmas in July Challenge! This card is delightful! 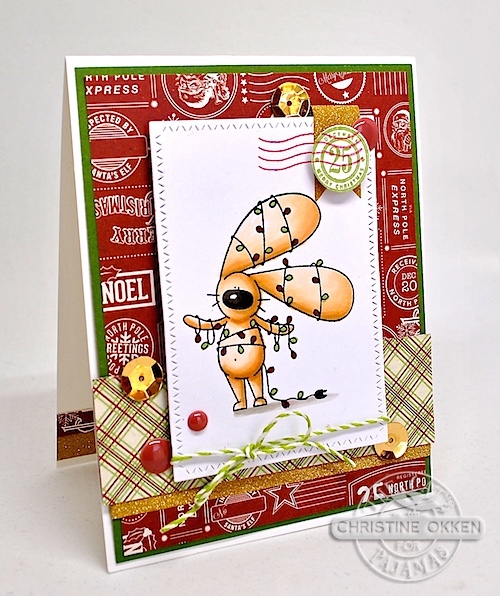 The paper layering is so festive and the bunny tangle image so cute. Thanks for sharing this design. Super cute and fun with all your festive touches! I would be just like your bunny. I don't know how my hubby manages so patiently every year. We melt when things heat up here, too. Since it's so unusual we don't have air conditioning. Right now, though, we're getting that cool marine air. Typical coastal weather. Awww poor little guy all tangled up, the light have got to be the hardest decorating for Christmas :) Love your little tab at the top too and great papers!